Voice announcements are made from WWV once every minute. The WWVH announcement occurs first, at about 15 s before the minute. The WWV announcement follows at about 7.5 s before the minute. The announced time is "Coordinated Universal Time" (UTC). UTC was established by international agreement in 1972, and is governed by the International Bureau of Weights and Measures (BIPM) in Paris, France. 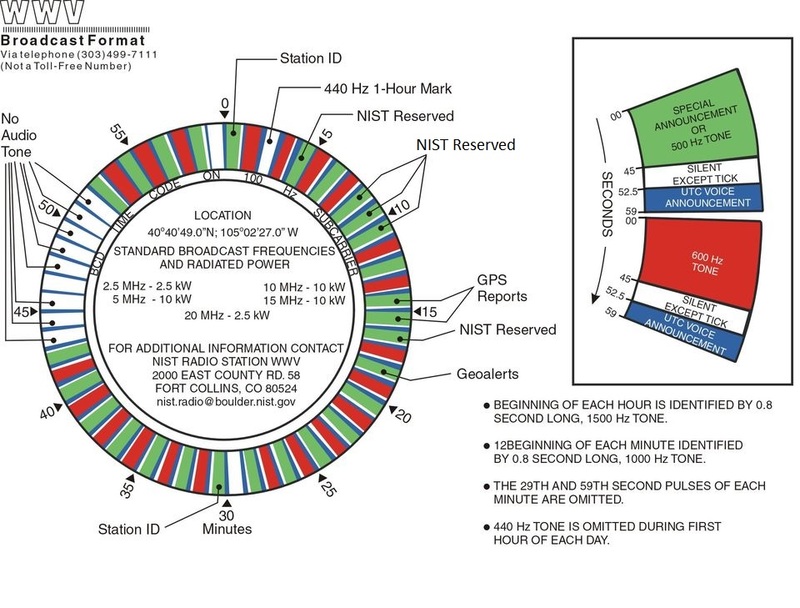 Coordination with the international UTC time scale keeps NIST time signals in close agreement with signals from other time and frequency stations throughout the world. Each seconds pulse is preceded by 10 ms of silence and followed by 25 ms of silence. The second marker for the broadcast is at the end of the 10 ms period and the start of the 5 ms period. The station's on-time marker is synchronized with the start of the 5 ms tone. The silence before and after the pulses makes it easier to identify the second pulses. As shown in the graphic below, the total zone around the second pulses lasts for 40 ms, consisting of 10 ms of silence, the 5 ms tone, and another 25 ms of silence. Then, the standard frequency audio tones resume. The schedule for the audio tones is listed in the table, with the minutes labeled from 0 to 59. The UTC time scale broadcast by WWV and WWVH meets the needs of most users. UTC runs at an almost perfectly constant rate, since its rate is based on cesium atomic frequency standards. Surprisingly, some users need time that is related to the rotation of the Earth, which is less stable than UTC. Applications such as celestial navigation, satellite observations of the Earth, and some types of surveying require time referenced to the rotational position of the Earth. These users rely on the UT1 time scale. UT1 is derived by astronomers who monitor the speed of the Earth's rotation. The A and K indices are a measurement of the behavior of the magnetic field in and around the earth. The K index uses a scale from 0 to 9 to measure the change in the horizontal component of the geomagnetic field. A new K index is determined and added to the broadcast every 3 hours based on magnetometer measurements made at the Table Mountain Observatory, north of Boulder, Colorado, or an alternate middle latitude observatory. The A index is a daily value on a scale from 0 to 400 to express the range of disturbance of the geomagnetic field. It is obtained by converting and averaging the eight, 3-hour K index values. An estimate of the A index is first announced at 2100 UTC, based on 7 measurements and 1 estimated value. At 0000 UTC, the announced A index consists entirely of known measurements, and the word "estimated" is dropped from the announcement. Space Weather describes the conditions in space that affect earth and its technological systems. Space weather is a consequence of the behavior of the sun, the nature of earth's magnetic field and atmosphere, and our location in the solar system. Space Weather storms observed and expected are characterized using the NOAA Space Weather scales. The abbreviated table below shows the levels of activity that are included in the announcements and the associated terminology. The descriptor used to identify observed or expected conditions is the maximum level reached or predicted. The NOAA Space Weather Scales are further described at the Space Environment Center's web site. Solar Radiation storms levels are determined by the proton flux measurements made by NOAA's primary Geostationary Operational Environmental Satellite (GOES). 1 Solar-terrestrial indices for 08 November follow. The Mid-latitude K-index at 1500 UTC on 08 November was 3. 2 Space Weather for the past 24 hours has been severe. Solar radiation storm(s) reaching the S4 level is in progress. Radio blackouts(s) reaching the R2 level occurred. No Space Weather storms have been observed during the past 24 hours. Solar radiation storms reaching the S4 level are expected to continue. Radio blackouts reaching the R2 level are expected. No Space Weather storms are expected during the next 24 hours. The announcements include the descriptor of the largest space weather event observed (2) or expected (3) in the first line of each section. The remaining lines give the type of events and the level observed for each one. In the example above, no geomagnetic storm information is included because none was observed or is expected during the period. In the case where none of the three types of events are observed or expected, the announcement would contain section 1, plus alternate section 2 and alternate section 3.